Which would you prefer? Two jars (tins) for 50 cents (just 25 cents each! ), or paying over $2 a can? My favourite MOO** mix at this time of year, when the weather is cooling and casseroles are featuring more on my meal plan, is the MOO Condensed Cream of Chicken soup - so easy to use instead of a tin and much, much nicer. I have a lot of recipes, mostly inherited from my mother and Wayne's Granny, that use tinned soup, especially condensed cream of chicken soup. It's a great casserole base, very versatile. It goes really well in chicken and rice casserole or a tuna bake. It makes a lovely version of scalloped potatoes too. The problem is the tinned version you buy at the supermarket isn't particularly healthful and it is very expensive. 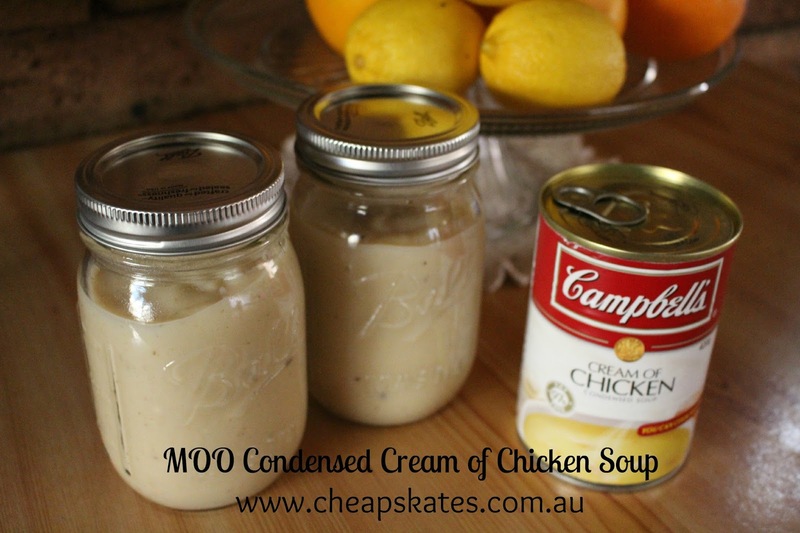 Tinned cream of chicken soup is over $2 a can - this recipe makes the equivalent of two tins and costs around 80 cents to make if you have MOOed chicken stock, about $1.50 if you have to buy it. It is cheap! Really, really cheap. And it is good! Really, really good. It is the easiest thing to make at home, and there are no special ingredients in it other than a stock cube if you don't usually use them. Let me ask you. Do you "can" these soups that you make? I have a pressure canner & was thinking this would be great to make a lot of & can it!! :) Any help would be appreciated. Like if you do this what pressure & for how long? Angie I usually make three times the recipe and freeze the excess in Ball jars. I don't have a pressure canner (it's on my dream list though) so it's not an option for me. I can't see why it can't be canned as any other soup is though. If you try it please come back and let us know how it goes. The soup freezes really well and thaws beautifully so it can be used as a soup or as a casserole base.